A chameleon voiced by Johnny Depp will have no problem trumping a politician in love, a teenage take on Beauty and the Beast and an '80s comedy at the box office this coming weekend. Coming off the disappointing domestic performance of The Tourist, Depp is poised to rebound with Rango. Gnomeo & Juliet is heading into its fourth weekend, so family audiences will be looking for something new. Rango will fill that need. Plus, parents won't cringe when forking over money thanks to the trust Depp has earned. While it's hard to open to more than $50 million in March, Rango should still post a healthy debut and then hold its audience well into the spring much like How To Train Your Dragon did last year. According to WebWatch, Rango represents a 4.56% market share of online opinions. That's healthy for a film aimed largely at younger moviegoers, but it's certainly not a strong enough number to indicate overwhelming appeal outside of families with young children. On Facebook, Rango has added a staggering 170,000 new supporters since early Monday morning. The film's total count of 232,000+ eclipses Despicable Me's total of close to 189,000 on the Wednesday before hitting theaters. Rango is generating more tweets than Gnomeo & Juliet, but it trails the likes of How to Train Your Dragon and Shrek Forever After. As of 5 p.m. PT, Fandango.com is reporting that Rango is responsible for 21% of daily sales. That number should see a slight jump on Thursday. 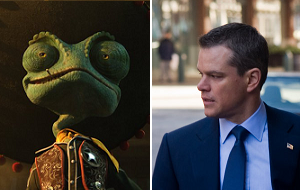 Look for Rango to deliver a debut of $43 million from close to 3,700 locations. After stumbling a bit recently with Invictus, Green Zone and Hereafter, Matt Damon looks like he has a solid mid-range hit on his hands with The Adjustment Bureau. The action/romance fusion is shaping up to be a viable date night option for older, more discriminating audiences. Universal's decision to mix both action and romance into the film's trailers may be paying off after all. According to WebWatch, The Adjustment Bureau holds a respectable 5.74% market share among unreleased films. On Facebook, The Adjustment Bureau has managed to accumulate nearly 38,000 supporters. That's quite impressive for an adult-skewing action flick. Twitter activity is also strong. The Adjustment Bureau is inspiring far more tweets than Unknown, Green Zone and The Next Three Days. Fandango is reporting that The Adjustment Bureau is responsible for a solid 6% of daily sales. Expect The Adjustment Bureau to bring in $20 million from around 2,750 locations during its opening frame. Just four weeks after the underwhelming debut of I Am Number Four, Alex Pettyfer is back with Beastly. Co-star Vanessa Hudgens brings a little bit of drawing power of her own thanks to her turn in the High School Musical franchise, but the pairing doesn't have what's needed to rake in a strong opening. Luckily, thanks to a modest production budget of $17 million, Beastly doesn't need a monster opening. According to WebWatch, Beastly holds a 10.46% market share of online opinions among unreleased films. That's not surprising considering that teen girls don't hesitate to show enthusiasm for a film online. On Facebook, Beastly has amassed more than 200,000 supporters. Unfortunately, that's very weak for a teen-skewing flick—Charlie St. Cloud has more than 700,000 and it still failed at the box office. On Twitter, Beastly is ahead of Remember Me and Charlie St. Cloud. Look for Beastly to rake in $8 million from about 1,900 locations. Take Me Home Tonight has "dud" written all over it. Star Topher Grace has very little clout at the box office, and the same can be said about co-star Anna Faris. '80's nostalgia didn't work for Hot Tub Time Machine, and it won't work here either. Expect this Relativity release to exit theaters in swift fashion. A $4.5 million debut looks likely for Take Me Home Tonight. Unknown (2011) Feb 18, 2011 Warner Bros.